Musings from an Astros fan in sunny Southern California. Thomas “Tip” Fairchild isn’t going to top anyone’s list of Prospects to watch in the Astros organization, but there was a time when he was one of the more promising players in the system. The Astros’ 12th-Round selection in the 2005 Rule 4 Draft – the same class that gave us OF (then-LHP) Brian Bogusevic, SS Tommy Manzella, RHP Chris Blazek, OF Eli Iorg, and C (then-3B) Koby Clemens – out of the University of Southern Maine, Fairchild is an unimpressive 6’2″, 200-pound right-hander. In that 2005 year, he landed first in Tri-City, where he threw 58.2 mediocre innings, going 3-6 with a 4.91 ERA and a 1.43 WHIP. But his 63 strikeouts and just 14 walks (though he did plunk six batters) raised a few eyebrows, and he was advanced to Lexington to start the 2006 campaign. There, he was used more-or-less full-time as a starter, and responded with a 1.65 ERA, 1.00 WHIP, and 98 strikeouts to just 19 walks in 109 innings. That prompted his mid-season promotion to Salem, where he continued to throw well. In fact, at the end of the 2006 season, he led all Astros minor leaguers in wins (14), strikeouts (142), and innings (173), all while carrying the fifth-best ERA, with a 2.45. 2007 saw a promotion to Corpus Christi, and the understanding that Round Rock was within reach for him. Then he felt something in his throwing elbow during his first start with the Hooks. One more tortuous start later, he was done for the season. That “something” that he’d felt had been a torn ligament, and Tip underwent Tommy John surgery that very year. He spent 2008 back in Corpus Christi, getting shelled as he recovered from the surgery. He threw sixty-one and a third innings, mostly bad ones. But he seemed to be regaining his control and confidence as the year went on. He was re-learning how to pitch. 2009 will be a watershed year for Fairchild. A player’s second year back from Tommy John surgery is generally regarded as the one during which they’re finally healthy enough to really be evaluated, at least physically. So, though he’s fallen off of the organizational depth charts, keep an eye on Fairchild. He might turn back into being one to watch. It’s pretty tough to get through a single conversation about the Astros that doesn’t turn toward the team’s lack of depth in the starting rotation. If you were to listen closely to many of the naysayers, you’d think that the Houston farm system may never produce another Roy Oswalt-type ace. Surely, you the True Astro Fans® are wondering, our farm system must have someone in it to give us hope… if not this year, than at least for the future. Well, the news is good, but maybe not great. The Astros actually do have some very promising pitchers in the system, but not very many at the top levels. Round Rock and Corpus Christi had fairly unimpressive staffs last year, and even the standouts didn’t tend to have fantastic lines. However, there are fifteen pitchers – not counting new free agent Chia-Jen Lo – that I think are worthy of note. This is a bit different from my last entry, because there I talked about players who might impact the big league roster this season. I didn’t talk about 3B Ebert Rosario, LF Brian Pellegrini, 2B Albert Cartwright, or one of my favorite prospects, OF Nathan Metroka. Their time will come. With the pitchers, however, I’m switching things up. It’s a position where the Astros have such a razor-thin margin of error that some shocking things may come up. Or, at the very least, some depressed fans may simply start to wonder if we’ll ever have any quality pitching coming from the farmhands. Any talk of the Astros’ pitching prospects has to begin with the three that excite me the most: One who will probably bear the Astros uniform this year, and two who almost certainly will not. I’ve talked before about Polin Trinidad, who played for the World team in the 2008 Futures Game (he earned a hold by allowing 1 hit and striking 1 out in his single inning of work… the one hit was to MegaProspect Matt LaPorta, who Trinidad erased from the basepaths by forcing Dexter Fowler to ground into a double play). He’s got the slim figures that I love to see in a prospect: 23-year-old lefty, 10-7, 3.14 ERA, 1.11 WHIP, 109 strikeouts in 169 innings — with only 32 walks. It’s hard not to get excited about his chances. His numbers budged a little bit with the move from Salem to Corpus, but his AA numbers were still stellar at 6-5, 3.61, 1.21, 75 K/21 BB in 107 IP. Projection: Polin got a Spring Training invitation this year, and I expect he should see some time in the majors during the regular season, as well. I’d still like to see him pitch a little deeper, and he may project more as a long reliever until he can do that, but this kid could be a future ace. Have I got you pretty excited about the Trinidad kid? Not so fast, my friends, because as good as he is, he may not have been the best prospect named Trinidad in our system last year. That’s because down in Greeneville, Jose Trinidad managed to string together one of the most mouth-watering seasons I’ve seen in a while: 3-2 in 10 starts (56.0 IP), 40 strikeouts, 2.73 ERA, 1.13 WHIP. That’s very exciting, but just how many walks did Señor Trinidad give up to go with those 40 strikeouts? Six. That’s right – he faced 241 professional hitters and walked just six of them. In the Appalachian League last year, 1,964 walks were issued. Six of them by Jose. And did I mention he didn’t allow a single home run? I’m really excited to watch this 20-year-old righty develop. Projection: 2-3 years away from even pitching at Round Rock. He’ll probably spend this year in Tri-City, though I wouldn’t be overly surprised if he jumped straight to Lexington. Jose wasn’t alone in Greeneville last year. There was one other starter who really grabbed my attention: Second-round draft pick Jordan Lyles. Just seventeen years old, Jordan threw 49.2 innings as a starter in Greeneville, and warranted enough attention that he also was asked to start two games for Tri-City (though he went just 5.2 innings between them). His Greeneville line was astonishing for someone his age: 3-3, 3.99 ERA, 1.09 WHIP. And of the 208 batters he faced, only 10 reached base via walk. Of couse, that’s more than Trinidad’s six, but consider that he did it while striking out 68. That’s exactly 4 strikeouts for every walk issued. He didn’t fare quite as well when he moved to Tri-City, but this is a kid who had been throwing to high school sophomores a few months prior. Very impressive. Projection: You try not to read too much into Rookie ball statistics, especially when you’re dealing with pitchers drafted out of high school. But Jordan showed he was at the very least worthy of the Astros’ second round pick, and I’m looking forward to seeing him progress over the next 4-5 years. There are four young pitchers who are likely to find significant time on the major league roster this season that I’m really looking forward to seeing. These are the guys nearing (or, in one case, past) “major league age,” where it’s do-or-die time for a pitcher. And these four guys appear poised to do very well in the majors. , as so many pitchers’ numbers do, but I like his make-up. I think he’ll be just fine. Though not quite as dominant, Joshua Miller had a similar issue last season: PCL hitters lit him up to the tune of an 8-9 record in 21 starts with a 5.41 ERA. Looking deeper, though, you see that this 29-year-old righty may have had the worst statistical year of his career, but when that still means a 1.39 WHIP, that’s not so bad. True, he only struck out 74 in his 148 IP, but he also only walked 19. And in 630 batters faced, he didn’t drop a single wild pitch. Projection: Miller isn’t our top prospect, but he’ll be thirty years old this season, and I think he’s got to get a chance somewhere along the way to play in the major leagues, where I think he can be a competent pitcher. I don’t expect him to knock anybody out, but I think he’s worthy of a legitimate shot. When Astros fans hear about the Rule 5 draft this offseason, we think of Wesley Wright, or maybe Lou Palmisano. Well, we didn’t even acquire Palmisano in the Rule 5 draft. The Orioles did, on our behalf, and traded him to us for cash money. Our Rule 5 selection? Why, Gilbert De la Vara. Gilbert and Wright share a lot of similarities – both 5’11”, 160-pound lefties drafted in the Rule 5 by Ed Wade and tacked onto a roster with a bullpen pretty much already set. And I think De La Vara can have the kind of success that Wright had. He went 6-3 last year as a bullpen guy at Wilmington (A+) and Northwest Arkansas (AA) for the Royals’ organization, and despite only 52 strikeouts to 27 walks in 77 innings, his WHIP was a razor-thin 1.08, including 1.16 at the AA level, with a pair of saves. Projection: I’d love to see Gilbert get some seasoning at the AAA level, but that won’t be possible since he was a Rule 5 selection. 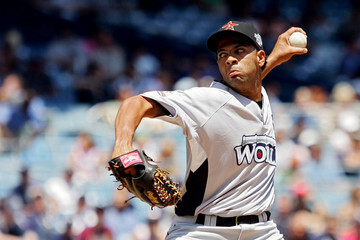 As it is, I think he fits very nicely into the Astros’ bullpen, perhaps even replacing Wright for 2009. Sergio Perez didn’t throw a lot in 2008 – just 27.1 innings at Corpus Christi – but his tidy 1.39 WHIP and 2.30 ERA showed that it didn’t affect him that much. He went 2-3 in 5 starts with just 18 strikeouts and 8 walks, but when you look at his 2006 and 2007 lines in Salem and Lexington, respectively, a fuller picture begins to emerge: 9-13 in 30 starts, 171.2 IP, 3.57 ERA, 1.32 WHIP, 123 K, 59 BB with 732 batters faced. Projection: Sergio will be just 24 this year, and I think he’ll split time between Corpus Christi and Round Rock; maybe a cup of coffee with the big league club. His WHIP has eked up slightly with each promotion, and I think the PCL will be a bigger adjustment for him than anything else he’s faced, but I suspect he’ll continue to pitch very well. The 2008 draft, as we know, was one of the better drafts the Astros have had in a while. Both Jason Castro and Jordan Lyles emerged as studs. When you look farther down the list, though, another name may jump out at you. Texas high schools are notorious for their fireballers, but the 2008 class didn’t really have a reprsentative from that category. The closest was Ross Seaton from Second Baptist School. The 6’4″ righty was expected to go to Tulane unless his signing bonus was right, which is part of the reason he fell to the Astros with the 109th pick of the draft. Then, in completely-atypical Astros fashion, they managed to sign him. Ross started 3 games in 2008 for the Greeneville Astros, and his numbers weren’t amazing. In fact, they were bad: 4 IP, 4 K, 2 BB, 13.50 ERA, 2.50 WHIP. But that doesn’t tell the entire story, as the simple fact that we were able to land him is a step in the right direction for the Astros as an organization. Projection: Put Seaton on the back burner. He’ll probably play a full season in Greeneville, and may not impress anyone as he learns the professional game. But with a 94-mph fastball, a sinking two-seamer, 85-mph slider, and a big athletic frame (he swings a good bat, too), he could turn out to be very good. I’d love to see him improve his changeup, because at the moment he doesn’t really have one. But he should be one to watch. We’ve heard so much about Felipe Paulino Del Guidice already that it’s almost hard to think of him as a prospect. He spent the 2008 season injured, throwing just two thirds of an inning for Round Rock (he gave up a hit, walked one, struck one out, and didn’t give up a run, in case you’re wondering.) He’s still one of the team’s top pitching prospects, though, as indicated by his invitation to Spring Training this season. Projections: I’m going to go against the grain and advocate Felipe spend a year in Round Rock. There will be opportunities this season for spot starts at the major league level, and he should be considered for that, but I think regular work is vital for him right now. Four pitchers are left on my list of 15 who are currently with the Astros in Spring Training. They represent a nice little cross-section of the organization, and each has his own strengths and concerns. Very few pitchers have the do-or-die feeling surrounding them this season quite the way Fernando Nieve does. He was supposed to be a back-end guy by now, if not actually the big league closer. And if he hadn’t been derailed by Tommy John surgery, he may have been. The last two seasons have been a struggle for Fernando, and as he enters camp this season, it’s time for him to prove that he’s back on track. I think he’ll do just fine. Projection: I don’t know if there’s room for Nieve right now at the major league level, but you can’t risk losing him. His upside is just too great. For that reason, I suspect he’ll stick around the bigs and actually get stronger as the season progresses. I really like this kid, and I think he’ll win back quite a few Astros fans. A lot of guys in the organization are high on Bud Norris right now, and fairly so. Last year at Corpus Christi, he went 3-8 in 19 starts, fanned 84 batters to just 31 walks, and clocked in with a 4.05 ERA and a 1.50 WHIP. I’m not quite as impressed with him as I am with some other guys in our organization, but there’s no doubt that someone who records 84 K in 80 innings has some upside. Projection: Bud will be a top-of-the-rotation starter at Round Rock, where he’ll spend time with the older guys and lock his game down. Next year, he may be ready for steady big league service. 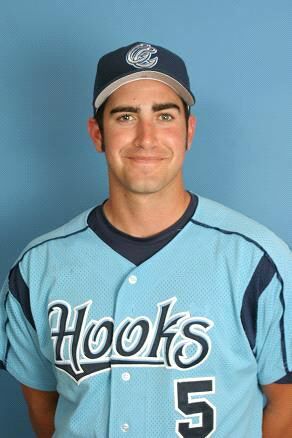 Brad James started 18 games last season for the Hooks. He won exactly one-third of them, and he lost exactly one-third of them. In 93 innings, he struck out 45 and walked 35. He allowed 107 hits, which put his WHIP at 1.53. None of these stats is stellar, but what I do like is that, of the 406 batters he faced, only 9 of them put his pitches into the seats. Projection: I’m not huge on James, but I think he can be serviceable. I particularly don’t like his ever-escalating WHIP: It climbed by 0.27 from A+ to AA ball. I would actually advocate he spend some more time in Corpus Christi before advancing to Round Rock. There are two more guys on my list of fifteen Astros pitchers to watch, and they’re at two different places in their careers, but both are capable of raising some eyebrows. the Astros will part ways. There’s a thoroughbred in Lexington, Kentucky, and he was let out to run every fifth day. He was fifth in the South Atlantic League in strikeouts (137), led the Legends starters in strikeouts, Innings Pitched (130), and ERA (4.02), and was second in WHIP (1.41) to only Anthony Bello. What I like most about this racehorse, Leandro Cespedes, is that he was only 21 last year and should get even better this season. He’s definitely one to watch. 574 batters faced, 137 strikeouts, 45 walks. Could be a keeper. Projection: I think Cespedes will spend most of the year in Lancaster, and we’ll see how he does against better – and older – competition. If he continues to mow them down, look for a move to Corpus Christi by the end of the year. So there you have it: Fifteen pitchers to watch. Do The Rangers Need to Make a Splashy Move? Are the Dodgers Ruining Baseball? Mike Rago on Are the Dodgers Ruining Baseball?